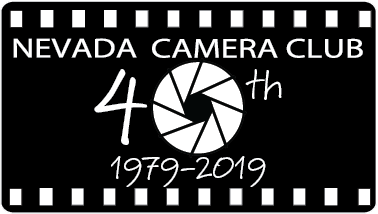 During the second general meeting held every month, except December, the Nevada Camera Club conducts a photographic competition which is open to all members. The competition alternates between prints and electronic images. Entries are grouped according to the class of the member (e.g., Intermediate), the category of the entry (e.g., Pictorial), and by the division (Color, Monochrome). Each entry is scored and evaluated by a panel of judges. Merit points are awarded to entrants based on the total score received by the entry. Based on the placement and scoring by the judges, the top scoring entries in each group are awarded ribbons. Members are asked to assist in conducting the competition and receive merit points for doing so. Take a seat and enjoy and learn from the judging. Please do not comment upon entries or the evaluations offered by the judges during the competition. Each competition entry is scored and verbal judging evaluations are given. These steps allow attending members to better understand how each entry has been evaluated and offers the opportunity for the judge(s) to provide constructive photographic evaluations that can be helpful to all viewers. Classification skill levels include Junior (under I 8 years of age), Beginner, Intermediate, Advanced, and Master. Divisions relate to the medium used to present the image. Images are presented as Prints or Electronic Images. are viewed by reflected light. Prints are divided into Monochrome and Color. Monochrome Prints - The range of tones in the image is under the control of the photographer and is critical to the quality of the print. Color Prints - Color creates separation within the image. are viewed on electronically charged elements. Electronic images are divided into Monochrome and Color. Monochrome - The range of tones in the image is under the control of the photographer and is critical to the quality of the image. Color - Color creates separation within the image. Categories - Categories are subject based and wide in definition to allow the photographer latitude in expression. NOTE: No specific category is defined by technique. Subject matter must be the defining parameter. Photographers are encouraged to experiment with, and learn to use. a variety of techniques available for creating a quality image to present for competition, Techniques abound for use in the camera during exposure, in the darkroom or on the computer while processing the image, and post processing for enhancement and presentation. Care must be taken in the Documentary, Nature/Wildlife, and Photojournalism categories - Normal photographic processes may be used to enhance the image quality but must not be used to alter the truth of the photographic statement of these categories. This implies not altering the factual representation. Current Nevada Camera Club Membership is required to enter the competition. A completed entry form and a $ 1.00 entry fee must be submitted for each entry. Print entries are accepted from 6:15 PM to 6:45 PM on the night of the competition. Members need not be present to enter. If you cannot be present during this time, please arrange ahead of time for someone else to submit your entries. Electronic Image entries must be submitted prior to l2:01 AM on the Tuesday preceding the competition by using the submission form on the Nevada Camera Club web site. Entries may have been originated within any time period. Entries that have won a Blue ribbon in a previous NCC monthly competition are not eligible. Unless otherwise announced, a maximum of three entries per member per competition meeting will be allowed. A maximum of two entries will be allowed in any of the categories other than “Club Challenge.” A maximum of one entry in the category “Club Challenge” will be allowed. The theme of each Club Challenge is announced in the NCC Newsletter Focal Expressions. There are five classes (Junior, Beginner, Intermediate, Advanced, Master); thirteen categories; and two divisions (Color, Monochrome). Print entries not picked up within three (3) months become the property of the NCC. Electronic image entries will not be returned. There must be at least three recognized judges present to hold a competition. All competitors must affirm that their entries are solely their own intellectual property. No component or element within the image may be a derivation of another artist’s work. Submission of your entry to the entry committee implies that your entry meets this requirement. NCC competition classes are: Junior, Beginner, Intermediate, Advanced, and Master. Choose your class according to your age, experience and knowledge of photography. At any time, a member may choose to advance to a higher class. While in the Beginning or Intermediate classes, winning ten first place ribbons will automatically advances you to the next higher class. The Junior class is restricted to members who have not reached their 18th birthday. After the scoring phase, the top scoring entries in a Class/Category/Division are selected for ribbon placement. Note that it is possible for an entry which is awarded a lower technical score to receive top placement. In this situation the top placing entry receives the ribbon based on its score. No entry will receive a higher place ribbon than that earned by the top placed entry, regardless of the score awarded to that entry. Winners will be announced and ribbons will be awarded at the end of the meeting, time permitting. The purpose of this award is to stimulate members to expand their areas of photographic expertise by enticing them to enter all categories of competition with the reward of a plaque to acknowledge this achievement. A plaque will be awarded at the annual banquet after a member receives a blue ribbon in a minimum of ten NCC monthly competition categories. The plaque will have adequate spaces for all thirteen categories which can be filled in subsequent years. The purpose of this award is to recognize members who have 27 different entries receiving a score of 27 in the monthly competitions. Any images receiving a score of 27 beginning January of 2012 will count towards this award. A plaque will be presented to acknowledge this achievement at the annual banquet. Ace award is given to an advanced or masters photographer who earns 30 blue ribbons beginning January 2012 in a category. A plaque will be presented at the annual banquet to acknowledge this achievement. Images may be horizontal, vertical or square. Horizontal Image -- The width must not exceed 1920 pixels. If the height exceeds 1200 pixels, then the height should be resized to 1200 pixels or less and the width should be adjusted to maintain the original aspect ratio. Vertical Image -- The height must not exceed 1200 pixels. Square image -- Width and height must not exceed 1200 pixels. Although there is no minimum size, it is to the advantage of each entrant to make their image dimensions as large as possible without exceeding the maximum dimensions listed above. Image files and entry form must be submitted using the submission form on the Nevada Camera Club web site. The primary negative(s) used in generating the print must have been exposed by the entrant. No frames or glass are allowed. Prints must be mounted. The minimum mounting size is 8” X 10”. Flush mount prints are allowed, i.e., the print and the mount are the same size and there is no matting. Prints may be matted. Multiple mats are allowed. -- Print from 110 film must be at least 5” X 7”. -- Contact print -- must be at least 4” X 5”. -- Polaroid transfer print -- no minimum size. The maximum size allowed for the print, mount or matting is 16” X 20” (horizontal or vertical). If the print is 16” X 20”, then it must be flush mounted. Any writing on the front of the entry, such as the title or entrant’s name, will be covered before judging. As this may distract from the entry’s presentation, such writing is discouraged. Affix the left part of the entry form to the back of the mount at the top center.